Call me a nerd but I love books like The Battles of Tolkien by David Day. This book takes a deeper look at many of the famous battles of middle earth. This book has the most beautiful cover of a faux leather with etchings of soldiers. Then you open it and you have the color pictures of maps, weapons and foes all through out. It is beautiful. If your a Tolkien fan this is one for your collection. My boys went on a Tolkien movie watching binge last summer, so they both thought this book was very cool. Diving into the details of battle really sparked their interests to re-watch. The history of J. R. R. Tolkien's fictional world of Middle-earth is filled with epic battles in an ongoing struggle between good and evil. The Battles of Tolkien recounts many of the greatest conflicts over thousands of years, from the earliest skirmishes of the Valarian Ages to the defining battles in the War of the Ring. 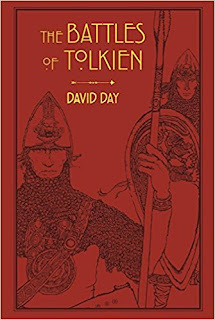 Insightful commentary by Tolkien scholar David Day discusses how the people, tactics, and weapons influenced the outcome of each battle, and also how the legends of Middle-earth relate to the real-world mythology on which Tolkien based his famous literary creation. Maps and full-color illustrations help bring this rich universe to life, making it an invaluable reference book for Tolkien fans of all ages. One lucky reader will win a copy of The Battles of Tolkien. I have not read this book but would love too! I don't have a favorite, i've never read his books. This looks like something my son would enjoy.